iTunes’ “Live From Soho” series offers significant online and offline promotion, so I was keen to find a classical artist that would fit into this predominantly pop-alternative campaign. In January 2010, Philip Glass became the first classical artist to make a recording at flagship Apple retail store in Soho. The store remained open throughout the performance, but more than 300 people filled the upstairs, standing in silence to hear more than 45 minutes of live, acoustic music. The recording is available on iTunes, and includes a rare performance of Philip and Ira Glass performing the Wichita Vortex Sutra. In November 2009, New York’s classiest Apple Store opened at 67th and Broadway. Because of the store’s proximity to Lincoln Center, Apple’s retail marketing team were keen to use it as a venue to cement Apple’s relationship with the arts world. This was the first Apple Store in New York to accommodate a Steinway D*, so this seemed like an excellent opportunity for some serious piano music. Working with EMI Classics, I arranged for Leif Ove Andsnes to give the first performance at the store. We arranged the show after closing time so the store would be quiet, but Leif was playing in the window, so despite the cold, crowds gathered in the snow outside. We let people in between movements so nobody would freeze. The concert was recorded for release on iTunes. Media coverage included the front page of the New York Times arts section. * There’s space for a Steinway D on the stage in the Soho store, but it won’t fit in the elevator, and the architects wouldn’t let me carry it up the glass staircase. I might have got away with it if I hadn’t asked first. When Alan Gilbert took over as music director of the New York Philharmonic in 2009, he was a celebrated conductor with a very small recorded output, unencumbered by a major-label contract and free to do something innovative. I worked with the New York Philharmonic to put together the first classical iTunes Pass. $149.99 bought a subscription to receive 30 concerts from Alan’s inaugural season, each released within a few weeks of the performances. The pass included the world premiere of Magnus Lindberg’s EXPO and the hugely successful performance of Ligeti’s Le Grand Macabre. At $149.99, this was hardly an impulse buy. If you treat it as 30 albums, though, this is one of the best-selling digital classical products of all time. 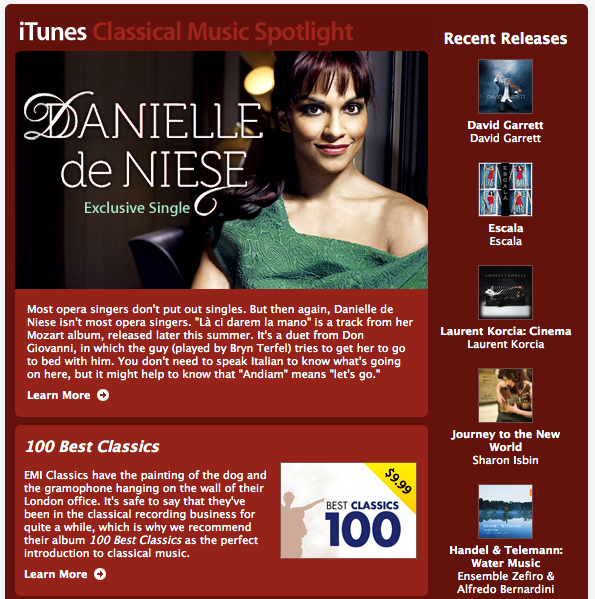 In 2006, I worked with Apple’s email marketing team to create the iTunes Classical Music Spotlight email newsletter. It was the iTunes Store’s first genre-specific email campaign, and quickly became the single most powerful tool at my disposal for promoting classical music. The exact number of recipients is confidential, but it’s fair to say it was in six figures, and it generated approximately ten times my salary in additional turnover. This became the model for other genre-specific email campaigns, although the Classical Spotlight remained one of the most successful, with unusually high open, click-through and conversion rates. After a while, they let me write the main US music newsletter as well. This was a lot of fun, and a great opportunity to sneak in some classical priorities alongside the pop, country and hip-hop. iTunes now has more than 200 million customers, so this is one of the largest email distribution lists in the world. It’s likely New Music Tuesday was read by more people than all the newspapers in the US. At iTunes, I looked after classical music for the whole world, but in the US, I also took care of soundtracks and jazz. When Fox and Sony had finished the pilot for Glee, they came to Cupertino to talk about ways we could work together on the show and its soundtrack. A soundtrack highlights album was scheduled for release at the end of the first season, but we arranged to release the songs performed in the show as each episode aired. Glee became the #1 TV show in America, and the first season’s performances generated more than $4m in revenue. In June 2005, the launch of iTunes 4.9 added support for podcasts. We were asked to put together a show to connect the podcast directory to the music store, and to demonstrate how to embed artwork and links into a podcast. The iTunes New Music Tuesday podcast was a weekly roundup of new releases written, produced and presented by the iTunes music programming team. It quickly became one of the most popular podcasts on iTunes. I built and ran the voiceover studio in Cupertino, and recorded more than 100 episodes of the show. In 2009, it was replaced by the Celebrity Playlist Podcast, for which I recorded several early episodes, conducting interviews with Drew Barrymore, Ellen Page, Juliette Lewis and Eve, as well as the pilot episode with Sir Tom Jones. DG Concerts launched on March 28th 2006 with the first in a series of live recordings from the Los Angeles Philharmonic, recorded a week earlier at the Walt Disney Concert Hall and released exclusively on iTunes. The launch received significant media coverage including the New York Times, LA Times, Wall Street Journal, Billboard, Gramophone and NPR. In 2012, Gustavo Dudamel’s recording of Brahms 4 with the LA Phil won a Grammy. All albums were released with full liner notes in PDF format, and were available at iTunes for at least six months before they became available in other digital stores. The League of American Orchestras published an overview of the project is here. Late in 2005, I was asked to help Apple’s ad agency (TWBA\Chiat\Day) find some music for a classical or jazz iPod ad. We were looking for a credible artist with mainstream appeal to showcase the breadth of music available in iTunes. I submitted a lot of music from Yo-Yo Ma and Wynton Marsalis. The feedback was that the Wynton tracks were all really good, but none of them were quite right. Could I help find some more? 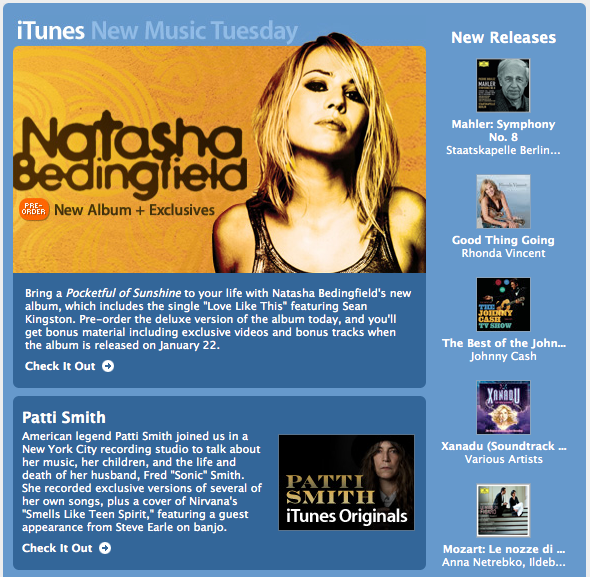 iTunes Essentials was a large-scale catalog marketing project aimed at increasing sales on a song-by-song basis, by using a large collection of professionally programmed playlists to encourage users to try music not otherwise connected by the store’s metadata. 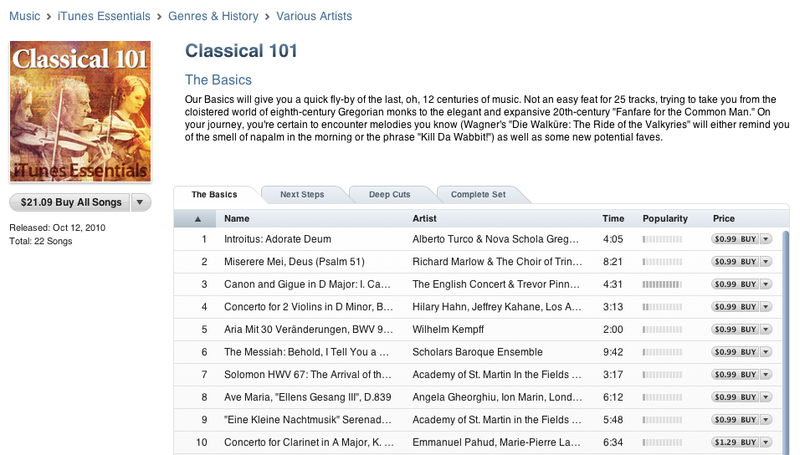 I made the first classical “Essentials” playlists, including Classical 101, which remained the best-selling iTunes Essential for several years.